I posted a short summary of the CCBA Conference yesterday, so today I thought I would describe the advanced track presented by Tom Seeley and Michael Palmer. Even though they alternated, I thought a separate post for each of them would make sense. This post is about Tom Seeley’s three sessions on topics related to wild bees, honey production control systems, and water management. I was especially looking forward to seeing Tom Seeley, as I greatly enjoyed his book Honeybee Democracy about swarming. Dr. Seeley’s first presentation was A survivor population of European honey bees living in the wild in New York State. This was my favorite talk of the day. The Arnot Forest is south of Ithaca, New York, where Seeley lives. Ravens, bobcats and bears wander the 4500 acres (7 square miles) of rather isolated forest. The forest area is not suitable for farming, which creates a genetically closed population for the bees. In August of 1978 Seeley wondered about the density of wild bees. So he used a technique called bee lining to discover 9 feral hives in a one area of the forest, averaging around 2.5 hives per square mile. He reported his research and didn’t think much of it for nearly 25 years. What happened to the original bees? How do they persist without treatment? In 2003 Seeley put up bait hives and caught 11 colonies. Of these, 100% had varroa mites, 9% (1 colony) had Chalkbrood, and no colonies had EFB or AFB. He looked at mite drops on a sticky board over 48 hours and in May found counts as low as 2; in October he found counts as high as 40. So the hives definitely have varroa, but seem to have found a way to coexist with it. Perhaps the bees in the forest have been repopulated from stock managed by beekeepers. There is a beekeeper outside the forest, and in 2011 he had two apiaries (one of which was later destroyed by a bear). Working with Professor Sasha Mikheyev from the Okinawa Institute of Science and Technology, he found very different genetics between the wild bees and the two nearby apiaries. So the wild bees have their own distinct genes and appear to be self-sustaining. Seeley also realized that he had samples from 37 feral hives in the Ithaca area from the 1970s, so Mikheyev was able to reconstruct the older DNA and compare it to 2011 samples. The 1970s bees had 15 distinct queen lineages across the hives, while the 2011 bees were derived from a few queens. So there has been large loss of diversity. The mitochondria DNA, which is only passed through the queen, was especially impacted and mostly from a single queen, while the nuclear DNA carried by both queens and drones was a little more diverse. Seeley posited four differences between the wild bees and colonies managed by beekeepers: hive spacing, nest size, nest structure, and genetics. On the first, the wild hives were about a half mile apart on average, so perhaps there was less drift and less robbing which resulted in less spread of disease and pests. To test this, he set up two apiaries, each with 12 hives. Of these, 10 hives had Golden Italian queens and 2 had New World Carniolan queens. The first apiary was a row of 12 hives, with the 2 Carniolans in the middle; while the second had 12 hives spread about and roughly 50 meters apart, with the Carniolans in the center. Neither apiary received any treatments. In the row hives, he found that 34% of the drones in the Italian hives were Carniolans and when a hive crashed it was robbed out. In the dispersed hives there was no mixing of drones and little or no robbing. As to nest size, the wild hives had a nest cavity roughly 1 Langstroth Deep in size. So he ran another experiment with two identical apiaries and no treatments. The first had 12 hives with single Langstroth Deeps to represent wild bee cavities; the second 12 hives had 4 Deeps to represent large managed hives. In the test, 83% of the small colonies swarmed while 17% of the large colonies swarmed. When he checked for varroa mites later in the season, the large hives averaged 6.2 mites per 100 bees while the smaller hives averaged 1.1 mites per 100 bees. Even more telling, ten of the large hives died over the winter while 10 of the small hives survived the winter. Seeley didn’t have a lot to say about the nest structure or genetics. The cell size was quite similar: 5.3 mm in the wild versus 5.4 mm in standard foundation frames, so smaller cell size was not a factor. The biggest difference was propolis, as wild hives he checked had a thick coating of propolis over the inside. He wonders if this might impact the health of the bees, though he is not sure how yet. In conclusion, Seeley offered five suggestions for beekeepers: disperse hives so they are farther apart, don’t exchange comb between hives to reduce the spread of pests and diseases, perform artificial swarming by making nucs, rear your own queens to generate local stock, and place drone comb in survivor hives to help propagate their genes. After lunch Seeley gave a second talk more related to his 1996 book The Wisdom of the Hive: The bee colony as a honey factory. He proposed that a bee hive can be thought of a factory, with the foragers collecting the raw materials (mainly nectar) and the food storers processing the materials into a finished product (honey). With this in mind, how do the bees keep the workers balanced between collection and processing, and how do they capitalize on a honey flow? Over the course of the talk he described the four signals used by bees to maintain the proper balance of foragers and storers. The following photo shows Dr. Seeley discussing the control system he described over the course of the presentation. 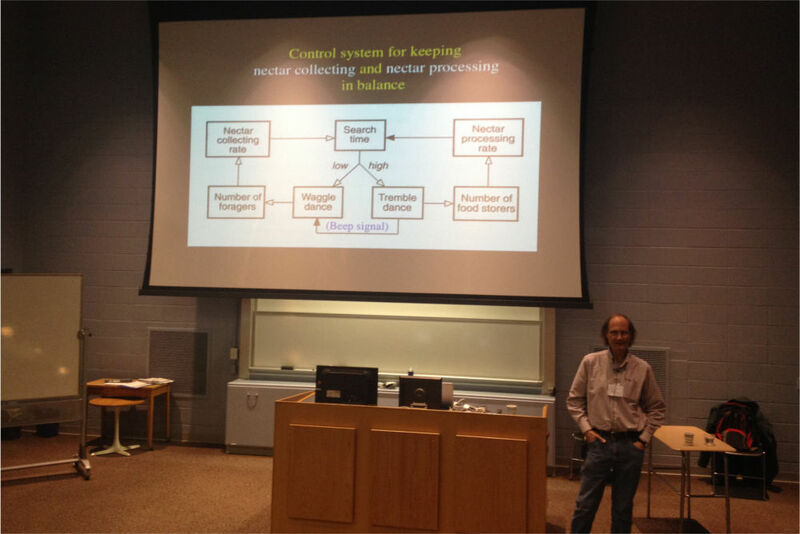 Professor Tom Seeley presenting the control system that keeps foragers and food storers in balance. The four signals he discussed are as follows. Waggle Dance: performed by foragers in a special area (the dance floor) to tell other forages where to find a nectar source. The dance indicates the direction and distance to the source, and the bees smell or sample the material to know what to look for. Shaking Signals: performed by foragers to activate additional foragers when few are found on the dance floor. Apparently foragers go to sleep when they have little to do, presumably to reduce energy consumption. Foragers shake other foragers with their forelegs to wake them up and encourage them to help forage. Tremble Dance: performed by foragers when more bees are needed to receive incoming nectar. The bees literally walk through the hive with a neurotic tremble to encourages bees to take up receipt and storage activities. This was discovered in the early 1900s but not understood until 1990 when Seeley himself understood its meaning during an experiment on foraging. Beep Signal: performed by foragers to discourage other foragers from waggle dancing. For example, when nectar receivers or other foragers are not available. In case you never heard of this (I had not), here is a link to a beep signal YouTube video he shared as part of the talk. The final topic of the day was Hive thirst: how does a honey bee colony control its water intake? Seeley pointed out that each year a bee hive generally collects 200+ pounds of nectar, 50+ pounds of pollen, 1-2 pounds of propolis, and 50+ pounds of water. He shared that bees generally search for water due to their own thirst, and that researchers activate water collection by shining a heat lamp on an observation hive. Like nectar, older bees collect water and pass it to middle-aged bees receiving water. One receiver bee he observed spent 7 minutes walking around the hive giving water to other bees, inspecting comb cells, and smearing water in comb cells (the hive cools as the water evaporates). Water collectors return to the exact same spot to retrieve water, “The very same pebble” says Sealey, which helps researchers track their activities. The bees stop collecting and receiving nectar as the time it takes to interest others in the water gets longer and longer. The title comes from Proverbs 16:25, which follows the stanza used for the prior post introducing the CCBA conference. This seems appropriate for the first presentation in particular. Beekeepers take actions that may appear to make sense but might not be in the bees best interest. This could represent treating bees as well as not treating bees; placing hives close together or moving comb between hives (or not moving comb in some cases!). A nice dichotomy that captures the need to measure the results with experimentation and understand what is actually happening in the hive. Hopefully our actions allow the hive to survive into the next year. The next post will cover Michael Palmer’s talks. Very interesting. One of my biggest hives has lots of thick, gunky propolis inside. I will have a think about ways to space my hives further apart. Good luck! I don’t even have an occupied hive yet and I’m thinking about spacing as well. The observation makes sense but how many amateurs have land to space hives 50m apart? And that assumes all the far-flung locations are equally good. We are largely constrained by keeping our hives out of the wind and wanting them near our house. Thanks for the report. We had only heard his honey factory presentation before. We have heard that bee breeders have historically selected for bees that produce less propolis because it can be such a nuisance to the beekeepers. Now that its importance to a colony’s immune system is known, some amateur breeders are selecting for more. We have not seen many reports comparing sticky vs hard propolis. Thanks for your thoughts., it does makes you ponder. We can’t magically start spacing hives or generating more propolis, but understanding the workings of the bees and feral hives hopefully gives insight into how best to manage bees. For me, I definitely want to look into how to split hives in the future to simulate swarming. This idea meshes nicely with Michael Palmer’s talk as well, which I hope to write up tonight. Thanks EEB. The comment about 5.3 cells size is interesting in light of the recent announcement from Cornell about the genetics of the Arnot forest bees. Yes it is. I hadn’t seen the announcement, so thanks for raising it to my attention. Seeley talked about the genetic work, nice to see it published, and he was surprised by the 5.3 cell size as well. As 5.3 is bigger than the average I’m seeing on my naturally drawn comb, I’ll remain skeptical if size is really a factor. I am of course excited to see where that genetic research goes though.